Almost half of young people claim they are intolerant or allergic to milk. 46% 16-24 year olds said they had adverse reaction to milk. Less than 1 in 10 older people had a problem with dairy. In Britain only 5% are thought to suffer maldigestion of lactose – the sugar in milk according to BNF. Bloggers are promoting cleam eating where gluten and milk are back for health. Ella Woodward recommends raw coconut water or almond milk as milk alternative. 13% said had adverse reaction to gluten. Less than 25%of people with food intolerance had had a clinical diagnosis of their condition and those who said they had food allergy less than 50% had seen doctor about it. The number of people claiming adverse reaction to foods is rising. In 2014 10% lived in household where someone had food allergy. In 2015 that was 13%. Britons drank 6.1 million fewer pints of milk last year – £240 million sales – Nielsen. NHS warns that cutting out dairy products can result in calcium deficiency. 67% of women took most or all of the responsibility for cooking and only 30% of men. We’ve designed a free14-Allergens-Posterfor you to download and print off to use to help identify the allergens in your recipes and menus. The Nutrition Program identifies the allergens in your recipes and shows them on the Food Label. 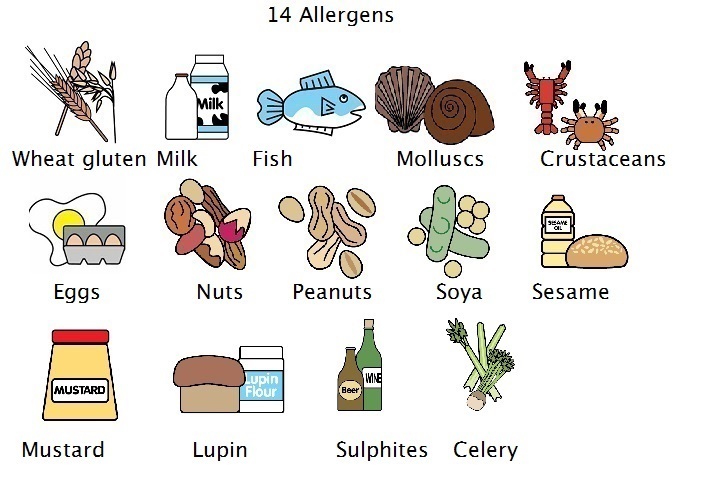 The Nutrition Program lists the allergens in ingredients. 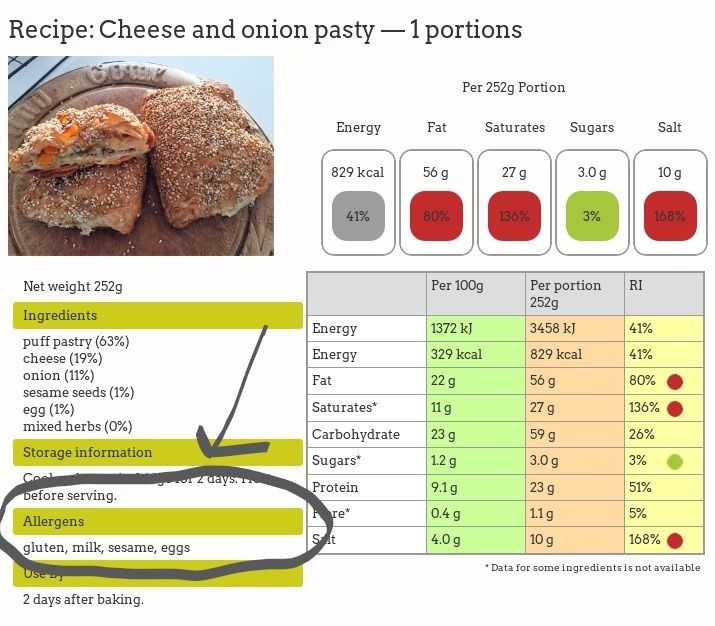 When you create a recipe the Food Label shows the allergens in a recipe like this Cheese and Onion Pasty.